The multi-university Consortium for Risk Evaluation with Stakeholder Participation (CRESP) has been funded as a Department of Energy (DOE) cooperative agreement for five years (2006 – 2011) awarded to Vanderbilt University as the lead organization. This five-year period is referred to “CRESP III,” as it was preceeded by two five-year cooperative agreements, CRESP I and CRESP II. The objective of CRESP is to advance cost-effective, risk-based cleanup of the nation’s nuclear weapons production facility waste sites and cost-effective, risk-based management of potential future nuclear sites and wastes. This objective is to be accomplished by seeking to improve the scientific and technical basis for environmental management decisions by the DOE and by fostering public participation in that search. 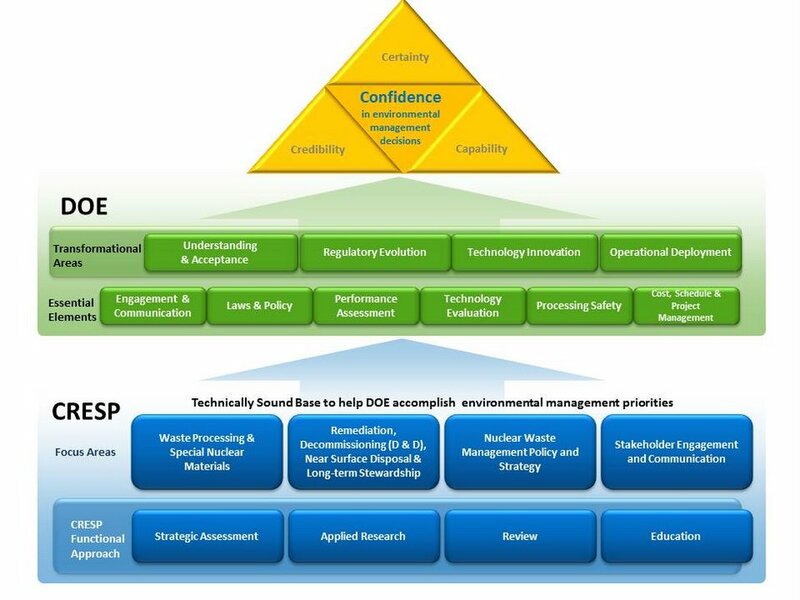 In each of these functions, CRESP is continuously engaging and fostering the effective participation of the full range of stakeholders, to help DOE integrate nuclear waste management. 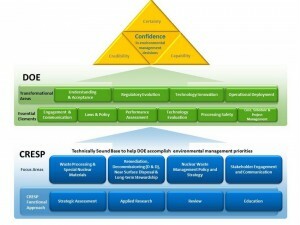 CRESP I and II (1995-2006) built a strong record of major assistance through both research and assessment to DOE-EM cleanup processes while establishing an exemplary record of converting the lessons from those activities into publication primarily in the nation’s scientific and technical peer reviewed journals. carrying out strategic analyses that illumine the causes and potential remedies for troubled nuclear waste management projects and programs and clarify paths for integrating the management of nuclear materials and wastes “at the back end” of fuel cycles and nuclear management regimes. Each of the strategic assessment initiatives is typically supported by applied research projects developing new approaches in greater depth. Applied research projects regularly anticipate future DOE needs which have routinely also built on strengths of CRESP researchers.